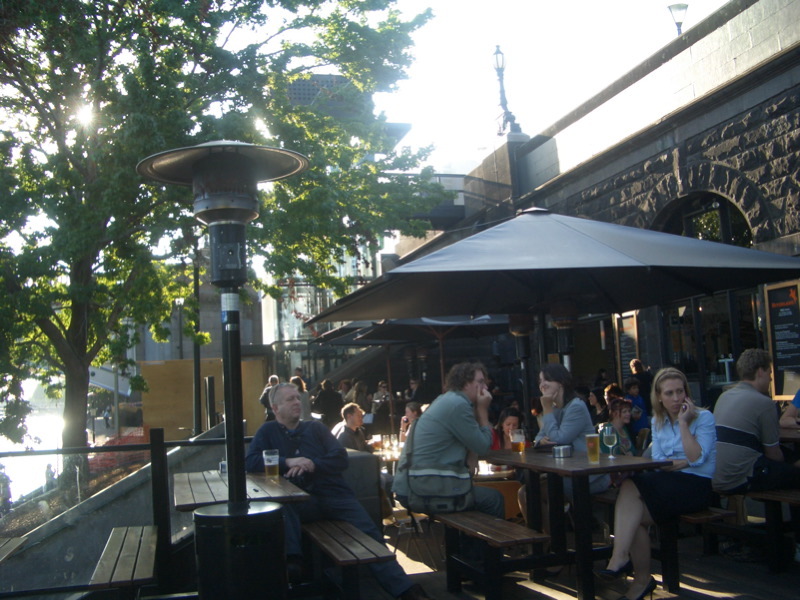 Tuesday evening was warm and sunny and at about 4pm K had given me a call suggesting we grab a quick drink somewhere in the sunshine after work. Seeing as she was down at Southbank rather than up at Parliament we decided to take a punt on Riverland. 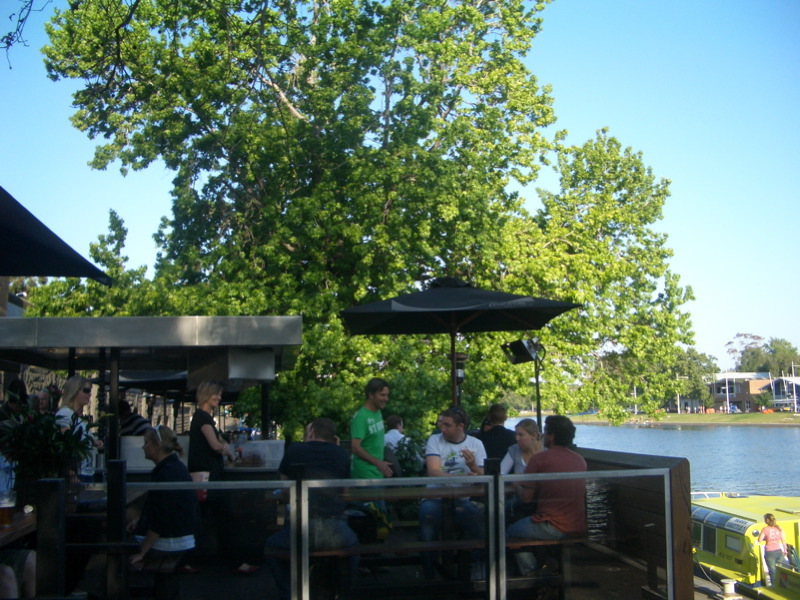 Riverland is located right down on the banks of the river behind Fed Square, opposite the rowing sheds. Last time I went there had been on a Friday night and it had been crawling with skanky brats and suits wearing fake tan, but happily on a Tuesday night the Wanker Quotient was pretty low. 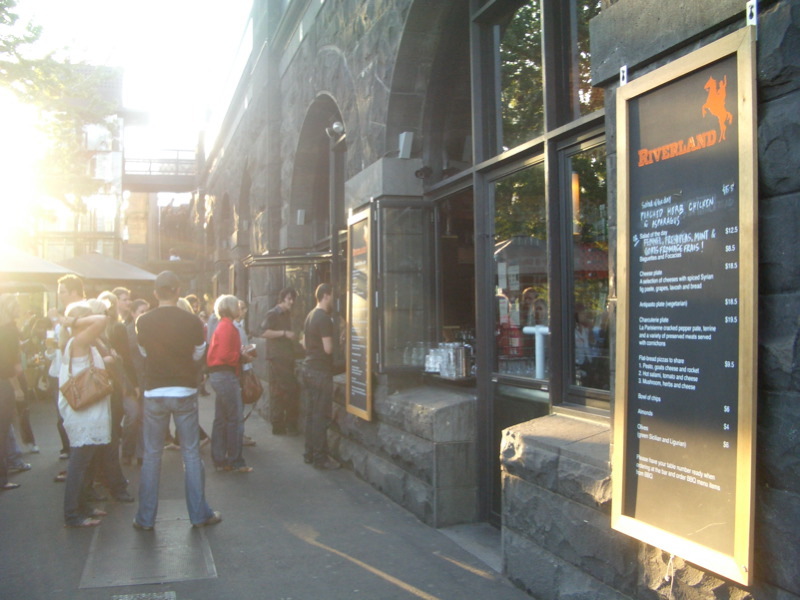 The bar is built into the the bluestone vaults that line that side of the Yarra. It was designed by six degrees, the trendy architectural firm that has designed a swag of other bars around town (eg Public House, Phoenix, Pelican, Albert Park Hotel, 3 Below) and has its offices in a vault just downriver. Outside the bar are some lovely big decking areas with tables, chairs and benches. K and I nabbed a table and we sat in the dappled sunlight, chatting over glasses of pinot. On one of the decks they've set up a nifty BBQ hut and we could smell sausages being cooked. Mentally casting aside home cooking plans for the evening, K & I followed our mouth-watering instincts and got some rather fancy hotdogs! They're $7 each, and come with grilled onions and sauerkraut in a viennoise bun. 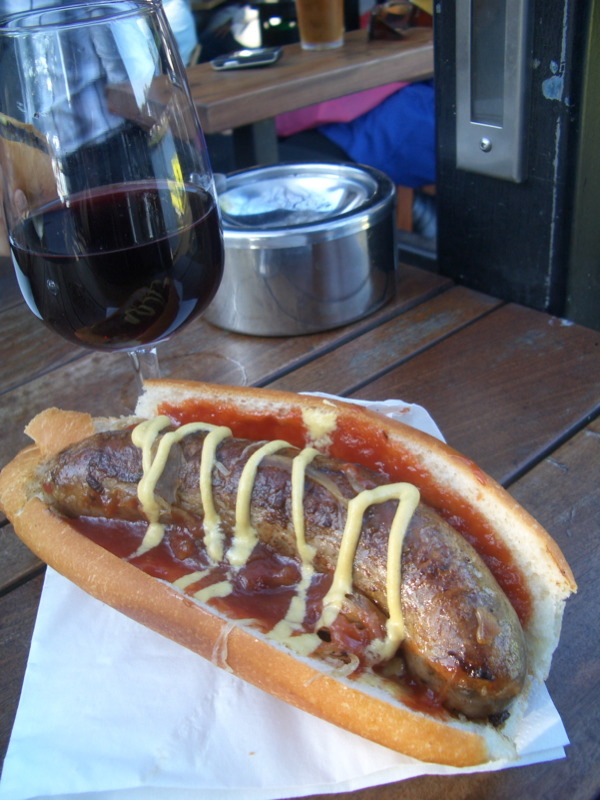 They have four kinds of sausage (no vegetarian ones, sorry Cindy) which all come from Morrison Street Butchers in Wodonga - Lamb, Chilli Bratwurst, Merguez and Duck & Pistachio. They also had an interesting-sounding salad of the day - fennel, fresh peas, mint and goat fromage frais - but alas we just got the hotdogs. Oh, and while I'm on the topic of the EG, did anyone else laugh when they saw Jim "Air Force One *****, A Fish Called Wanda **, The Castle *" Schembri's review of Elizabeth: The Golden Age? The film has met with near-universal critical thumbs down (Margaret and David criticised the "overblown direction" and felt it was "more bodice-ripper than a penetrating historical drama", the A.V Club felt that it "plays like history written in bits left over from old perfume commercials", and the Movie Show sniggered that Clive Owen clearly had the "smouldometer" turned up to 11), and every other review I've read has agreed that Elizabeth was clearly the superior film. i wish e.g would have a bit more phillipa hawker or jake wilson or...any of the others on their roster and a little less of the schem! ps: how funny were margaret and david wearing their green 3D glasses the other night (for the CG flick, beowulf) - priceless! 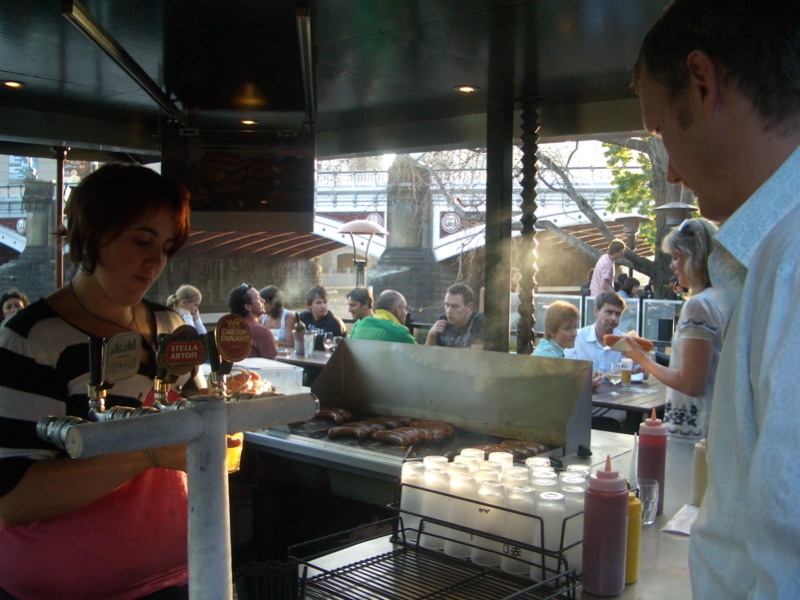 pps: will have to try one of those fancy sausages, yum! 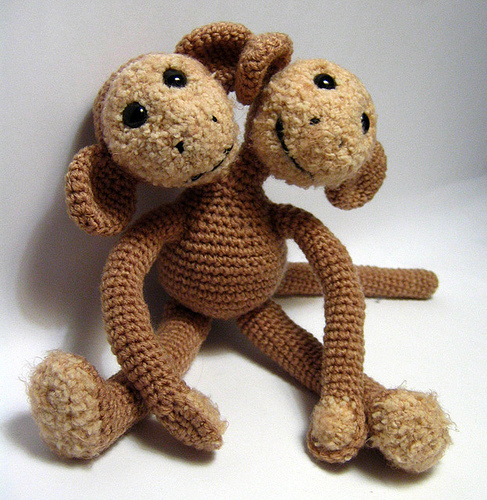 Yes, boo to schembri and a big HOORAY for Margaret and David! I once dated a guy doing a cinema PhD who interviewed David about the Cannes film festival - he said he was just brilliant. And Margaret is a patron of the Human Rights Film Festival that my friend is organizing this weekend! I'm sorry I missed them wearing the 3D glasses last week! But if you miss the episode, you can always read their reviews (including their hilarious conversations about the films) online. I like counting how many times Margaret can say "like" and "you know" in a sentence, and I love their chemistry together. Hmmm, possible unresolved sexual tension???! ?